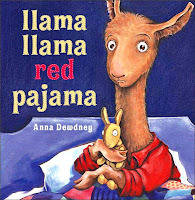 This rhythmic story tells the tale of what happens between mama and baby llama after the bedtime story and good night kiss. What mama hasn’t stood at the kitchen sink after tucking her child in bed, only to be interrupted when her child needs comforting? A sweet story, enjoyable for the mama too! The B has started to realize that books have more value than just as something to taste, so we’ve been having a few minutes of story time each day. 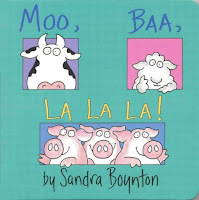 This is one of our favorites for the beginning baby reader. Who wouldn’t love three singing pigs? Last night felt like a night of 1000 wake-ups. My sweet B was suffering from a number of irritations: teething and runny nose, numerous mosquito bites, and undoubtedly a headache from the bump she received from a toy carelessly dropped on her head by her sister. I’m sure all of this conspired to give her a very fitful sleep, with wakings every hour all night long. Not to mention two night-wakings from the Ant Bug tossed into the mix, and the result is one grumpy Mama. But around 3 a.m., as my patience had nearly reached its limit, I thought again of Elder Holland’s words and had to smile. I began debating the size of the shadows under my eyes: certainly bigger than Rhode Island, probably more like Michigan or Minnesota. And I was grateful once again for inspiring, uplifting words. That is why I have started this blog. To nurture myself and you in all of our mama moments. "You are doing terrifically well." “It is clear that some of those Rhode Island–sized shadows come not just from diapers and carpooling but from at least a few sleepless nights spent searching the soul, seeking earnestly for the capacity to raise these children to be what God wants them to be. Moved by that kind of devotion and determination, may I say to mothers collectively, in the name of the Lord, you are magnificent. You are doing terrifically well. The very fact that you have been given such a responsibility is everlasting evidence of the trust your Father in Heaven has in you. He knows that your giving birth to a child does not immediately propel you into the circle of the omniscient. If you and your husband will strive to love God and live the gospel yourselves; if you will plead for that guidance and comfort of the Holy Spirit promised to the faithful; if you will go to the temple to both make and claim the promises of the most sacred covenants a woman or man can make in this world; if you will show others, including your children, the same caring, compassionate, forgiving heart you want heaven to show you; if you try your best to be the best parent you can be, you will have done all that a human being can do and all that God expects you to do. “We thank all of you, including our own mothers, and tell you there is nothing more important in this world than participating so directly in the work and glory of God, in bringing to pass the mortality and earthly life of His daughters and sons, so that immortality and eternal life can come in those celestial realms on high. “You can’t possibly do this alone, but you do have help. The Master of Heaven and Earth is there to bless you—He who resolutely goes after the lost sheep, sweeps thoroughly to find the lost coin, waits everlastingly for the return of the prodigal son. Yours is the work of salvation, and therefore you will be magnified, compensated, made more than you are and better than you have ever been as you try to make honest effort, however feeble you may sometimes feel that to be. “Mothers, we acknowledge and esteem your faith in every footstep. Please know that it is worth it then, now, and forever. My oldest daughter, age three and a half, will be known as The Ant Bug. My sweet baby, quickly approaching one year old, will be known as The B. My dear husband will be The Dad. And I am The Nurture Mama. The Ant Bug has recently started calling me Mama. I used to be called Mommy or Mom. For awhile she repeatedly inquired “what does Daddy call you?” until she learned my real name. But now she calls me Mama. Is it because we live in the south? I’m not sure what prompted the shift. But I like it. I am woman. But mostly I am mother. Of all the jobs for me I’ll choose no other. four little, five little, six little babies in my home. I used to sing this song as a child, growing up in rural Alberta. I sang it to my dolls as I wrapped them tenderly in their blankets. As a very young girl, I knew what was most important. Like any child, I went through stages of what I wanted to be when I grew up. A teacher. An author. An astronaut. An archeologist. When I went to college, I wanted to be a librarian. But I had trouble deciding on a major. I floated back and forth between English and Psychology. Eventually at BYU I figured out that Marriage, Family and Human Development was the major for me. Because no matter what I ended up doing as a job, my career, my role, was to be a mother. And I knew I would need all the help I could get. Now I am a young mother of two sweet girls. And there are diapers and tantrums and messy floors and sleepless nights. And tears-sometimes from the babies, sometimes from the mama. But through it all, I am strengthened when I remember that mothering is a divine role. I am blessed with the power of motherhood. And there are so many sweet moments: hugs and kisses and songs and story time. So Nurture Mama has been born. To nurture me and you, as we carry out our divine role to nurture our children. one little, two little, three little babies I can love. four little, five little, six little blessings from above.